PHILADELPHIA—Looking from afar at the score of the Eagles 26-21 loss to the San Francisco 49ers, you might think it was a close exciting game by two dynamic offenses. 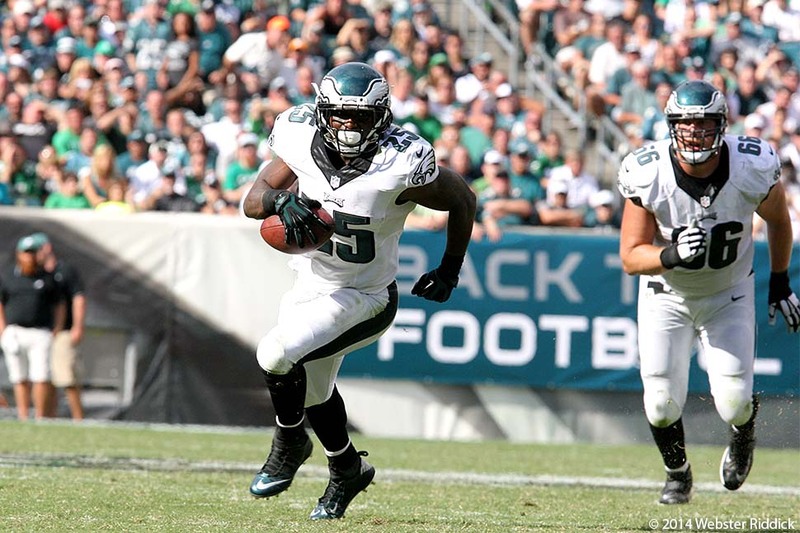 Eagles running back LeSean McCoy is averaging just 2.7 yards per carry in 2014 after leading the NFL in rushing in 2013. Photo by Webster Riddick. Instead, the Eagles portion of the final score hid the lack of production of an offense that produced zero points, crossed midfield just once, committed four turnovers and could not run or throw the football. If wasn’t for a blocked punt for a touchdown, an 82-yard punt return by Darren Sproles and an interception for a touchdown by safety Malcolm Jenkins, it would have been a 26-0 49ers shutout. The Eagles came into the game missing three offensive linemen due to injury and suspension and they were exposed by a 49ers defense that put pressure on quarterback Nick Foles, who had problems finding his receivers. He was sacked just once, but most of the day avoiding rushers. When you have a patchwork offensive line, what happened on Sunday is inevitable and the Eagles lost this game in the trenches and they could not get anything going throughout the game. After passing for over 300 yards in his first three games, Foles was 21-of-43 for 195 yards, no touchdowns and two interceptions. Meanwhile, the struggles of the Eagles running game continued as LeSean McCoy gained just 17 yards on 10 carries. For the game, the Eagles had just 213 yards of offense after averaging over 400 in their first three games. Coming into the next to the last drive of the game, the Eagles had not crossed midfield and had just 127 yards of offense. Incredibly, for all those struggles on offense, the Eagles still had a chance to win the game. When the Birds finally crossed fifty, they moved the ball to the 49ers one-yard line with two-minutes left after a five-yard run by McCoy from the six. The Eagles were one yard from pulling out a win. They had two downs to get one yard. You would think Chip Kelly would have called at least one running play in that sequence, especially with three time outs. With the way the running game was going, Kelly and offensive coordinator Pat Shurmur had no confidence in letting McCoy getting the ball here. If you saw the television replay on the third and goal play, the 49ers linebackers were about two or three yards behind the defensive line and looked like they were playing to defend the pass. A more experienced quarterback sees that and calls a running play or maybe Kelly and his offensive coordinator see this and signals the quarterback to call a running back. If the Birds coaches didn’t see it, FOX color analyst Troy Aikman saw it and pointed out how far the linebackers were away from the line during the replay of Foles incomplete pass to tight end Brent Celek and said the Eagles should have considered running the ball there. Even if the Birds didn’t get in the end zone running the ball in that situation, the threat to run on fourth down might have had the 49ers creeping their linebackers and safeties close to the line. Instead, the Niners, knowing the Eagles were going to pass, kept their linebackers and defensive backs covering the end zone. Those two errant passes yielded nothing and they turned the ball over on downs. After the 49ers were forced to punt, the Eagles had another chance to win the game. Unfortunately, the Eagles couldn’t get beyond their own 31 and on fourth and 24, Foles threw his second interception to end the game. Last year, the Eagles had a healthy offensive lineman and they were among the league’s best rushing teams. This season that’s not the case with guard Evan Mathis and center Jason Kelce on the injured list and Lane Johnson out due to suspension. The good news for the Birds is that they get Johnson back at the right tackle position this week. But will it help the Birds to get better in the trenches to open holes for McCoy and to enable Foles to find open receivers downfield? With the New York Giants and Dallas Cowboys starting to play well, the Eagles need to figure out a way for that line to get better. When it was over Thursday night at Yankee Stadium, it felt scripted. 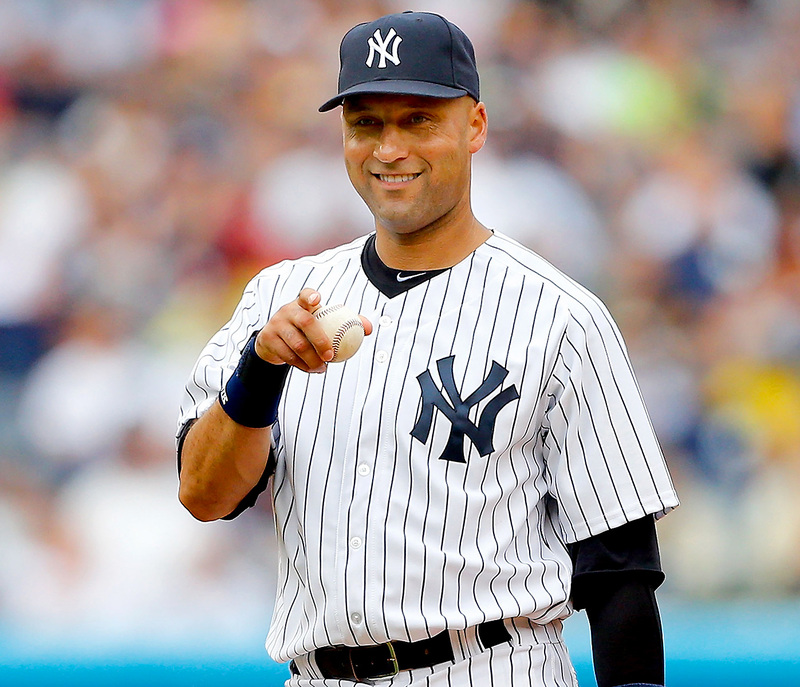 Derek Jeter’s next stop is the Baseball Hall of Fame in Cooperstown. Derek Sanderson Jeter, the elegant shortstop with the rough-house hockey player’s name, lined the game-winning single in the bottom of the ninth of his final home game in the Bronx to put an exclamation point on the most extraordinary Yankee career since Mickey Mantle called it quits over 45 years ago. That Jeter’s euphoric swan song came on the 41st anniversary of Willie Mays saying goodbye to America was somehow apropos in degree of love. There are some sports figures, regardless of statistics, that are bigger than life, so easily identifiable that they become ingrained in the culture, breeding reactions one way or the other. Jeter has always been such a figure. While pundits and lover-haters argues where the Captain belongs in the pantheon of New York sports legends, there was no debating two points. * The last 20 years should be known as the Jeter Era in New York sports and…. * No Yankee everyday player ever went off into the sunset so gloriously and yet unscathed as the Pequannock, N.J. product. Some were better. A handful won more often. But in the ultimate irony, for two decades one of the ultimate Yankees was the quintessential Artful Dodger, staying out of trouble, maintaining his poise and earning enough respect to be appreciated by a large portion of non Yankee fans. Think about some other great Yankee everyday players. There was no tragic ending like Munson or Gehrig. No aloofness or injury like Joe D. No prima donna theatrics like A-Rod or Reggie. And no unhealthy lifestyle underlined by a degree of sadness like Mantle or Ruth. It wasn’t perfect, but like DiMaggio’s swing and stride it was the epitome of grace. Oh, there could have been an even better ending with his team missing the postseason for a second straight year. After so much early glory, the Yankees won only one world title in Jeter’s final 14 seasons and missed the postseason in three of his final seven. Some have picked on his defensive deficiencies (including a negative career defensive WAR) and noted that he might not have been the best or most important Yankee when they won four world titles from 1996-2000. With this ammunition, any analysis would leave him off the list of top five players in franchise history and any top 20 list of all players. But other numbers tell another story and in Jeter’s case, the whole always seemed to exceed the sum of its parts; he was the guy you didn’t want to face with the game on the line in the late innings. Unlike his talented es-teammate Robinson Cano, October was his time with some 200 career postseason hits, many of them memorable and important. Many have criticized the over-the-top nature of his farewell tour (remember that Mays retired only five days before his night, while Mantle called it quits in Match). But is there ever any good way to say goodbye to our heroes? The light of their glory, while bright, always shines too briefly. With this sentiment for a moment Thursday night it felt like the 2001 World Series again with Jeter’s game-winning homer earning the unique moniker of Mr, November. And yes, since it was his first walk off hit in seven years, one couldn’t help but wonder if he was served up a meatball like Denny McLain delivered to Mantle in the closing days of 1968. But such is so often the legacy of great ones; so many things go right that we often wonder if their path is scripted. They see things we can never see and hold the keys to kingdoms of which most of us can only imagine. So it has been for the Yankees’ unscathed captain, who Thursday night added one last special chapter before stepping away into our collective memories. Jeremy Maclin has been the big home run hitter among the Eagles receivers. Photo by Webster Riddick. PHILADELPHIA—When the Eagles released DeSean Jackson last season, the big concern was could the Birds replace Jackson’s production (82 receptions, 1,332 yards, and nine TDs) and his ability to stretch the field? So far, the Eagles are 3-0 and the passing game, even with the slow starts, really hasn’t missed a beat without the speedy Jackson, now playing for Washington. The Birds air game ranks second in the NFL. To be honest, I don’t think the Eagles really miss Jackson as good as he was last season. Chip Kelly’s offense gives everybody a chance to contribute and has the defense having to pick their poison. Quarterback Nick Foles is averaging 326 yards passing per game and has six touchdown passes. Three of those touchdowns have gone to wide receiver Jeremy Maclin. The former Missouri star leads the team in receptions (16), touchdowns (3) and yards per catch (18.5). Though he’s not as fast as Jackson, Maclin is a more versatile wideout. He is catching passes running across the middle, on screen passes and on the deep ball. He has scored touchdowns in all three games. By the way, Maclin is no slowpoke and he does run 4.4 40-yard dash. “Mac is doing a great job every time he’s out there,” Foles said. 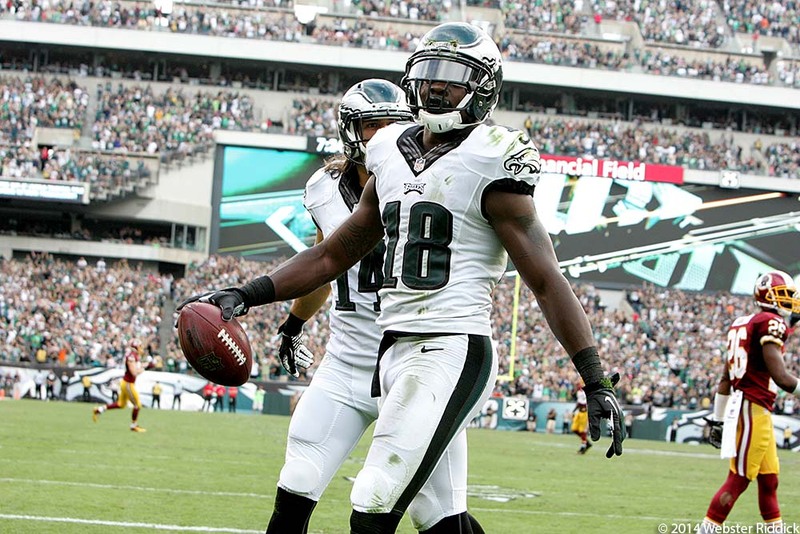 In Sunday’s win over Washington, Maclin caught eight passes for 154 yards and one touchdown. He would have had two if not for an illegal block in the back by center Jason Kelce on a screen pass. Kelly said he’s not surprised by Maclin’s performance. Eagles rookie Jordan Matthews had a big game against Washington last Sunday. The former Vanderbilt star caught two touchdown passes. Photo by Webster Riddick. And so far, Kelly is not wrong about the talent the Eagles have at the wide receiver position. 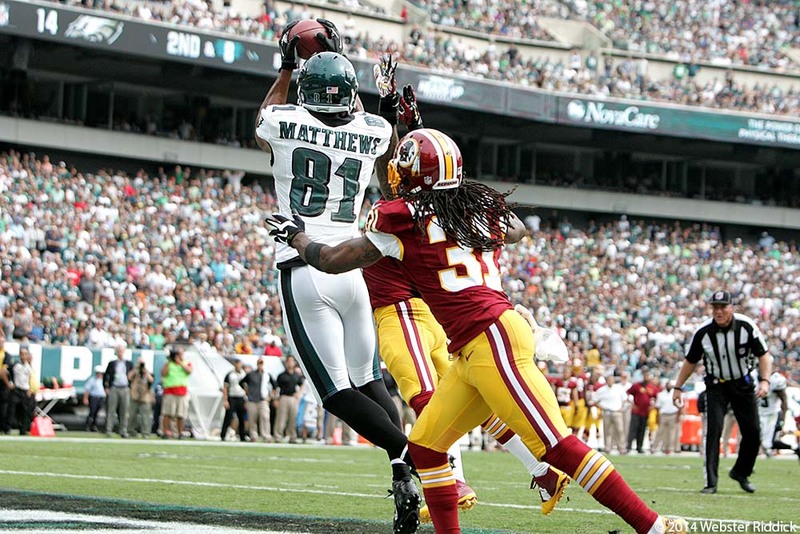 Rookie Jordan Matthews had a breakout performance against Washington. He caught eight passes for 59 yards and two touchdowns. Both scores came inside the red zone thanks to his tall 6-3 frame. Having tall wide receivers like Matthews and Riley Cooper to maneuver the red zone is something the Birds haven’t had in quite some time. 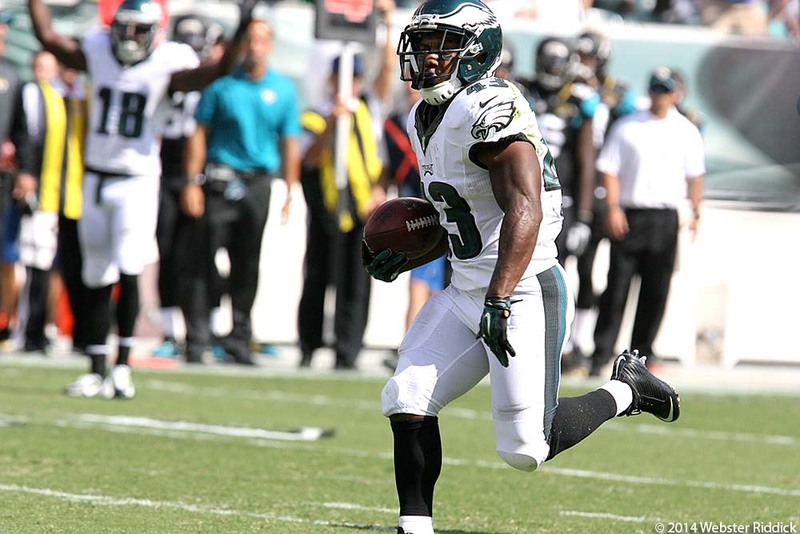 For the first two weeks of the season, the game-breaker in the Eagles’ offense has been Darren Sproles. If it wasn’t for his explosive plays in both running game, the passing game and on special teams, the Birds might be 1-2 instead of 3-0. Washington was well aware of both Sproles and LeSean McCoy managed to keep them under wraps. In fact, Washington’s defense forced a fumble from Sproles. The problem was they couldn’t stop the rest of the Eagles offense. All of these things bring us back to Foles, who put on a gutsy performance against Washington. After surviving some tough starts, the former Arizona star has found a way to put the Eagles in the win column. Foles’ best moment in the season thus far came in the fourth quarter of Sunday’s win over Washington. With 10:07 left in the game, Foles, who leads the NFL in passing yardage, threw a pass that was ruled an interception by Washington cornerback Bashaud Breeland. As Foles moved to forward to anticipate a run by Breeland, he took a hard hit from Washington defensive lineman Chris Baker and wound up on the ground writhing in pain. The hard block on Foles caused a huge melee along the sideline and resulted in the ejection of Baker and Eagles offensive tackle Jason Peters. Meanwhile, the interception was overturned and Foles recovered to lead the Eagles on an eight play, 76-yard drive that would culminate in a 27-yard touchdown pass to Maclin that put the Eagles ahead for good. What makes Foles play even more remarkable is that he’s had to play behind a patchwork offensive line with injuries to Evan Mathis, Allen Barbre and Kelce to go along with the suspension of second-year starter Lane Johnson. “I said it before about him and I knew it because when I played against him in college, he’s going to stand in there, he’s a tough sucker. He got hit a lot (Sunday),” Kelly said. 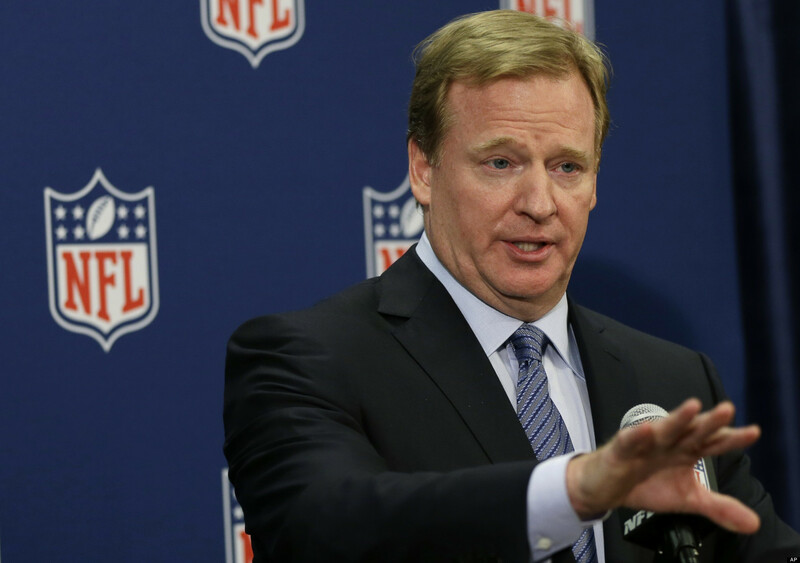 NFL Commissioner Roger Goodell has been under fire for how the league has handled domestic violence incidents. Is there a North American pro sports league more disrespectful to women than the NFL? At a time of year when the continent’s most popular league would love for you to be focused on fantasy stats and jersey sales and what game you will be attending next, rarely has there ever been a worse series of events in terms of public relations, in particular towards women. Commissioner Roger Goodell either saw or should have seen the contents of the Ray Rice elevator assault. Adrian Peterson, another player without any previous track record of violence, turned himself into police after video evidence suggested he beat one of his seven children with a switch. Once one of the game’s most admired figures, he is now a pariah. 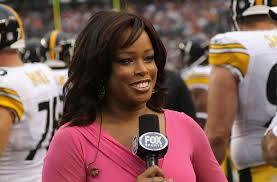 Pam Oliver has been roaming the sidelines for FOX sports, but was removed from the No.1 broadcast team for a younger Erin Andrews. Before all this came down was the demotion of 19-year sideline reporter Pam Oliver, one of the most respected journalists in the business, for the younger Erin Andrews. And let’s not forget the offseason lawsuit by Raiders cheerleaders that resulted in a $1.25 million settlement in back pay. All very different situations and yet all, on some level, degrading to at least one demographic of women. The ugly flip side is what these transgressions say about large portions of men in our sporting society. As Hannah Storm, a mother of three girls, suggested last week, are so many willing to compartmentalize their emotions and look the other way when spouse abuse and child abuse is concerned? Ageism is another issue on another level. We see sideline reporters about five minutes a game and listen to them for 10. As men are we so pathetic that we have to have the prettier face (if that’s what you consider Andrews) for those few minutes while discarding someone who has been a credible news source for almost two decades? This is no slight on Andrews, who had done a lot to prove her worth as a poised reporter in recent seasons. But what does it say about us when a 50-something year old black woman (who looks like she’s 35), who is not only a pioneer, but one of the best in her field, is so easily dismissed? And is the offense more sexist or racist? The cumulative evidence right up to Goodell’s press conference Friday which answered nothing, is disturbing. In a league so eager to punish players for dunking the ball over the goal post or for not having their jersey tucked in, there’s a whole other set of rules (and not appealing ones) when it comes to women. The term ‘zero tolerance’ has become a punch line, too often more machismo than substance, just a shadow of what should be a firm message for the demographic that makes up 45 percent of the league’s fan base. Will it get better and when? That the Vikings deactivated Peterson and Panthers did likewise with Greg Hardy are reactionary moves. As the NFL waits for the winds of anger to blow over, new cases, like that of Jonathan Dwyer, come to the forefront and old wounds are re-opened. Like the winds of change, those winds are turning too slowly with too many negative messages recently for healing, if not learning, to begin. For a league so eager to protect its shield that is the worst possible outcome, not only in its ignorance, but in that it has to be pressured to protect so large a segment of its fanbase and workforce. Federovitch is a former sports reporter and editor with the Trenton Times. 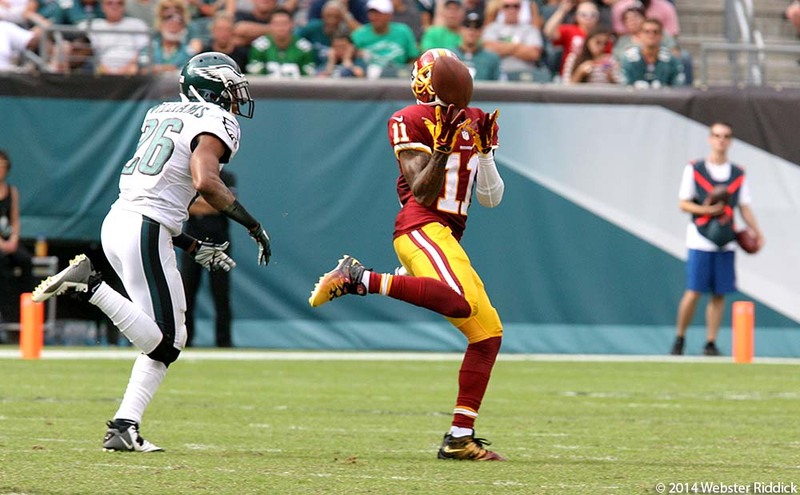 Washington wide receiver DeSean Jackson speeds past Eagles cornerback Cary Williams for a 81-yard touchdown pass. Photo by Webster Riddick. PHILADELPHIA—For the first three games of the season, the Eagles have gutted out wins by overcoming slow starts and coming from behind to win. In Sunday’s 37-34 win over Washington at Lincoln Financial Field, the Eagles overcame a 10-point deficit and withstood a late Washington rally that included a few fights and some trash talk from former Birds wide receiver DeSean Jackson. But not all is happy in the Eagles 3-0 paradise—at least for one player. While everyone in the Eagles locker room celebrated a hard-fought victory over a division rival, the way the Birds have won does not sit well with cornerback Cary Williams. He said the team’s slow starts are because they come into the game already tired because practice is too exhausting during the week. Throughout his tenure as the Eagles head coach, Chip Kelly has been preaching about taking a more scientific approach in terms of conditioning, players getting proper rest, diet, and special sports drinks to go along with practicing at a fast-pace. Williams is definitely not a big fan and said it’s affecting the team on the field. “Something has to change, something must be done and I’m not the only one who feels this way. I’m just man enough to stand before you and let you know we gotta fight during the week and then we gotta fight on Sunday. It’s not fair it’s difficult to do that in this league because everybody has talent,” Williams said. Even though the Eagles managed to pull the game out, Williams said the fatigue got worse in the second half, which may explain why he and safety Nate Allen got burned on an 81-yard touchdown pass from Washington quarterback Kirk Cousins to Jackson late in the third quarter. During the game itself, Washington rolled up 511 yards of total offense-including 427 yards passing. While the games have been thrilling and entertaining for the fans, Williams said the Eagles can’t keep winning at the rate they’re going and it’s taking a toll on him physically. Williams said his teammates are feeling the same way and hinted that the players who were saying they were fine with Kelly’s practice methods last season weren’t being honest. By the time Williams was finished talking with the media, most of the Eagles players had cleared the locker room. Eagles tight end James Casey said he didn’t have any problems with Kelly’s practice methods. Casey said outside of a few nicks and bruises that he was feeling okay after today’s game. “We do a lot during the week, but everyone’s fine and we’re winning a football games,” Casey said. Williams said he was not fine—not before the game, during the game nor after the game. It will be interesting to hear Kelly’s reaction to Wiliams’ comments during his day-after game press conference. Use of PEDs has apparently become a problem in mixed martial arts. LONDON, England–Social issues in sport are a well-publicized topic throughout the media, today. And with how the media in many different forms is so accessible now via modern day gizmos and reading platform that surface, what feels like every other quarter, society now has a voice that wasn’t afforded to us in the past. Whether it is racism, ageism, gender discrimination or another social implication that is often discussed regarding sport, the matters seem to be discussed most on the many forums and media platforms that inhabit the Internet’s vast landscape. Internet World Stats recently published an infographic showing that there are currently an estimated 2.8 billion people with Internet access globally –a figure that is only set to continue to increase. Gaming Realm, an illustrious gaming developer behind online portal and PocketFruity documented that the world’s smartphone use is now at a reported 16%. All this points to the fact that society has never had such a potent voice or ability to change circumstances they feel are incorrect or implemented in a haphazard manner. One frequently discussed matter of late is the use of Performance Enhancing Drugs (PEDs) in the mixed martial arts promotion, UFC. There has been a raft of high-profile fighters failing drug tests, most notably American wrestler, Chael Sonnen. Sonnen, a supposed “company man” and one of the biggest pay per view draws in the sport failed a recent drug test and has been subsequently banned from the sport for two years. But the sanctions don’t end there: apart from losing any possible revenue from fighting for the next two years, he’s also lost his presenting job with Fox Sports. So what are the social implications for viewers? Sonnen was viewed by many as the UFC’s blue-eyed boy. He was someone who could do no wrong in the eyes of UFC President Dana White and a man who was essentially being groomed for bigger things. However, all this went up in smoke when he failed the aforementioned test. For the fans of Sonnen and the UFC to see one of the poster boys of the sport fail such a test can only have a negative affect on the image of professional mixed martial arts. The damage cuts deep, very deep. Unfortunately, it sends out so many bad messages to the MMA community. If someone of Sonnen’s profile was taking PEDs, does this mean you can only get to that level of the sport if you take PEDs? Does it mean that everyone in the sport is engaging in illegal substances to reach the elite level of the sport? The questions are boundless and the implications are extremely damaging. The most worrisome message that it has sent out is that the use of PEDs is both needed and accepted if you can hide it. This is not a message that should be out there for the next generation of MMA nor for the fans to be reading about on the many MMA websites and social sharing platforms. It’s an uncertain time for MMA, in general, and the only way this problem can be eradicated or at least controlled is by the organization cutting fighters from their rosters and taking a stand against PED users with more frequent drug tests. Utilize the many social platforms to voice your opinion and instigate change. The next generation of athletes should know that you can succeed in this world by hard work, not by purchasing PEDs.